Workshop will be held Friday June 30th & Sunday July 2nd at the DoubleTree Hotel in San Jose, CA. Online Pre-registration will end Thursday, June 29th. Dance workshop participants will receive a packet with all music, words and translations to the dances they will be learning. No guests or outside people allowed in the classroom. No video-taping allowed but you can bring a battery-operated CD or tape recorder. 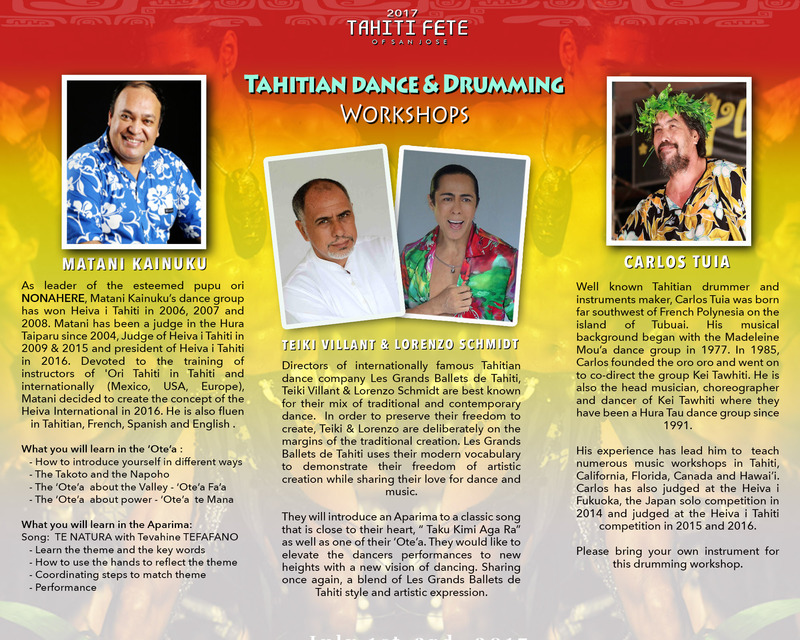 Please bring a pareo to the dance workshops and your instruments to the drumming workshops. An e-mail will be sent confirming the room location for the workshop which will be located at the Doubletree Hotel in San Jose. We will also post the location on Facebook and our website should you not receive the email. Please print the receipt email for your records. Registration will be available at the door however price will be $95.